More so than any other consumer packaged good, grooming products carry enormous expectations among users. Kiehl’s – a much-loved cosmetics brand for those in the know, understands that the relationship between consumer and the product is personal, and is one that’s inherently related to self-improvement. For many, the journey undertaken to find your version of an ‘ideal self’ will inevitably include turning to personal care products. And the only way brands like Kiehl’s can be well-positioned to help users attain this notion of their future self, is by demonstrating a connection to the local market. Here’s a great example I came across in Phuket Airport on my way back from the Easter break. 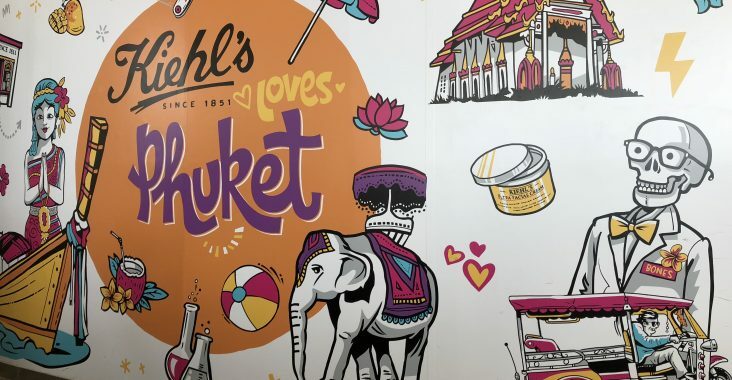 It would be very easy for a western brand like Kiehl’s to forsake adopting a local flavour in their point-of-sale advertising, and we’ve seen countless failed examples of what happens when consumers are unable to connect with a brand due to an absence of relevance. Incorporating iconic visuals instantly synonymous with Thailand — the tuk-tuk, temples, longboats and Thai dancers — into their highly recognizable visual identity, and teaming it with brand staples like Mr. Bones creates a clear message to the audience: we’re a brand who values and understands you. If consumers can’t connect with a brand, then they won’t be encouraged to get acquainted with, experience the outcomes of using, or have any sort of relationship with that brand. As part of their quest for the perfect me, they just won’t connect with the promise of what the brand experience can potentially do for them, because the messaging triggers simply miss the mark.